Humboldt Bay is the largest estuary along the U.S. Pacific coast between Coos Bay, OR and San Francisco Bay, CA. 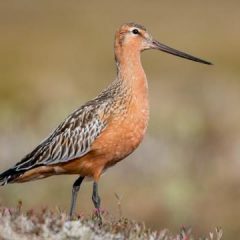 As such, it is vital for migratory and wintering waterbirds, especially shorebirds; it is a site of International importance under the Western Hemisphere Shorebird Reserve Network (WHSRN). Diverse habitats, including rocky jetties, sandy ocean-fronting beaches, and expansive intertidal flats, offer foraging opportunities for a rich shorebird assemblage. At any one time between August and May, the bay supports 20-25 species of sandpiper and plover. While the community of shorebirds is diverse, we know less about the population sizes of individual species, and this deficiency affects conservation. The last attempt to conduct bay-wide surveys was a quarter century ago, when coordinated efforts of multiple observers provided estimates that are probably accurate to within an order of magnitude. The imprecision of these estimates is also evident in the substantial variation in abundance detected over 2 hours when flooding tides inundated survey areas; this variation arose from small-scale flock movement prompted by the moving tide and predators. The data and imprecise nature of these population totals begs improved estimates of shorebird abundance conducted across the annual cycle. The objectives of this study are: 1) to conduct a series of coordinated high-tide surveys of shorebirds at roosts around Humboldt Bay during spring (Mar-May) migration; 2) to collect data to provide an estimate of abundance for individual species; and 3) to communicate these results to conservationists seeking to enhance recognition and protection of bay habitats. A group of 10 qualified observers will be trained in estimating large numbers of birds using software available in the Wildlife Department at Humboldt State University. On four subsequent occasions in March, April and May 2018, observers will conduct simultaneous counts of shorebirds at high-tide roosts around Humboldt Bay. Observers will be equipped with spotting scopes and binoculars and will move (on foot, by kayak, or car) within predetermined sections of the bay for a 2-hour interval bracketing spring high tides. During surveys, observers will count or estimate the total number of individuals observed of each species, georeferenced onto digital images. These data will be entered as shape files into a geographic information system for subsequent analysis. Humboldt Bay is a critical wetland along the Pacific Flyway, which links populations that breed in the arctic and northern habitats with trans-equatorial regions occupied during the non-breeding season. The expectation of this project is that these surveys will provide improved estimates of abundance for individual shorebird species visiting Humboldt Bay during the spring migration, and solidify the bay’s importance to the assemblage of shorebirds that rely on its diverse habitats year-round.